The Russian Navy is claiming to have outfitted warships with a high tech weapon capable of making enemy soldiers go temporarily blind, become disoriented, and nauseous. Russian media reports that two Northern Fleet frigates have been fitted with the new "non-lethal dazzler-type weapon, the 5P-42 Filin (eagle-owl)" — as it's been described by the manufacturer — a "non-lethal visual-optical inference device" purportedly capable of preventing enemies from properly aiming their own weapons. The cutting edge weapon produced by Ruselectronics has elsewhere been described as emitting an oscillating beam of high-intensity light which can not only suppress enemy targeting abilities, but disrupt night vision tech and laser target sensors. Forty-five percent of the volunteers reported feeling dizzy, nauseous, and disoriented. Twenty percent are said to have experienced hallucinations, described as “a ball of light moving in front of [our] eyes.” The company didn’t specify how many people participated in the tests. The "non-lethal dazzler-type weapon, the 5P-42 Filin," (or eagle-owl), reported in Russian media this week. According to the Protocol on Blinding Laser Weapons, for example, armies are prohibited from deploying weapons which cause permanent blindness, something the makers of the Filin say it doesn't do, but could produce temporary blindness. 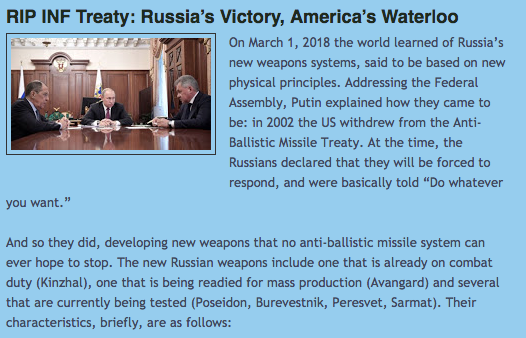 As Business Insider concludes: "As Russia's weapon reportedly only causes temporary blindness, there would be no legislative restrictions on its use, not that legal issues may be of any real concern." Interestingly, US officials last year the accused Russia of conducting a clandestine "sonic attack" using what would be a similar device to cause mysterious brain injuries and nausea in embassy personnel stationed in Cuba. But scientists later said the strange sound in the Havana embassy area possibly making diplomatic staff ill was most likely the result of crickets.